F What Is It Good for? Over the past week and a half I have again been struggling with the ubiquitous grade “F”. As I have had meetings about student achievement, or lack of it, I have come back to the question that I ponder every year. Is the “F” really a needed grade? The letter “F” brings many connotations to light and none of them are positive. 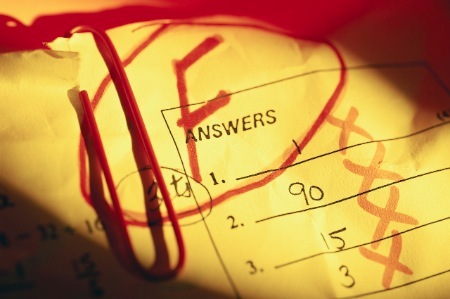 An “F” grade not only demoralizes the students but often times it is an affront or insult to the parents as well. The questions comes down to what are teachers trying to tell the students? The use of the “F” shows the how our current system of education is antiquated and needs to be revamped. Our current system of education is predicated on the industrial revolution. This system emphasizes process and final product. Students are conditioned to go through the process and then turn in their product. At this point they forget what they have learned and move on to the topic or task. This could not be farther from what our society needs right now. Our society today is about constant change. Most people work in three or more fields in their lifetime, as opposed to the one stable job of the past. In many industries there are no longer final products but rather versions of products. It is this sense of change that education needs to start incorporating into the education process. Our society is always working to improve on past products. Things are not created and then forgotten but reworked and improved. This is how our education process should be teaching students. The emphasis in education should be on the learning process. If a student does not meet the objective of the class, they should take another look and create another version that will meet the standards of the course. Students need to learn that unlike the past, today’s society is going to require that they become life long learners. They are going to have to return to school or a trade school at various times in their lives to get upgrades on their knowledge. In this type of educational system, there is no need or purpose for the “F”. We are not telling students, “You failed and don’t get it,” but rather, “This version did not work too well. See if you can improve on this.” This is a big shift in educational philosophy but one that will better prepare our students for the future.